4-color offset printing is the most common form of commercial printing used around the world today. Offset color lithography using cyan, magenta, yellow and black (CMYK) inks in combination has been the standard for mass quantity print production for nearly 100 years. 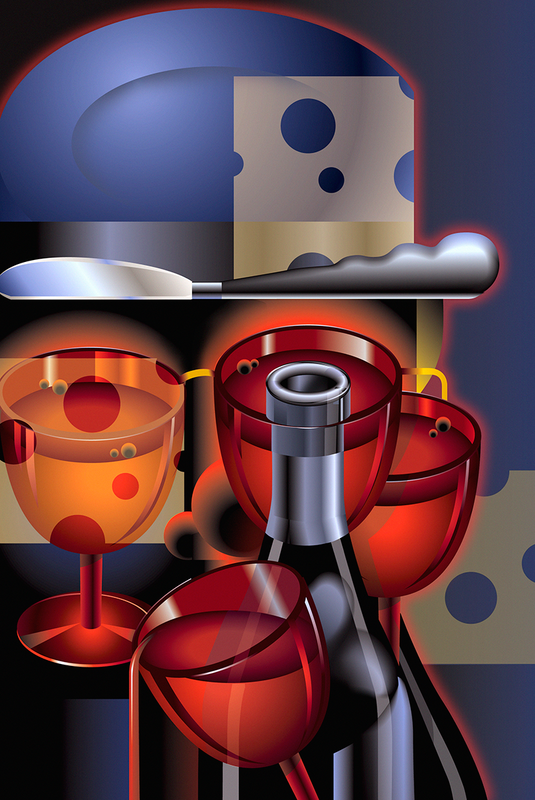 Nearly every full-color illustration created for print is reproduced using CMYK based technology, whether it be printed using offset lithography or digital printing processes. The term offset lithography not only is used to classify a form of printing it actually describes how the printing operation occurs. Essentially, an image is offset from a printing plate to a flexible blanket and then offset from the blanket to a paper surface. The plate never directly contacts the paper itself. Offset differs from older, contact printing technologies such as letterpress and gravure, which were based on a printing plate contacting a paper surface directly. A major advantage to offset lithography is that an image on a printing plate is “right reading” as opposed to having to be backward as in contact printing. 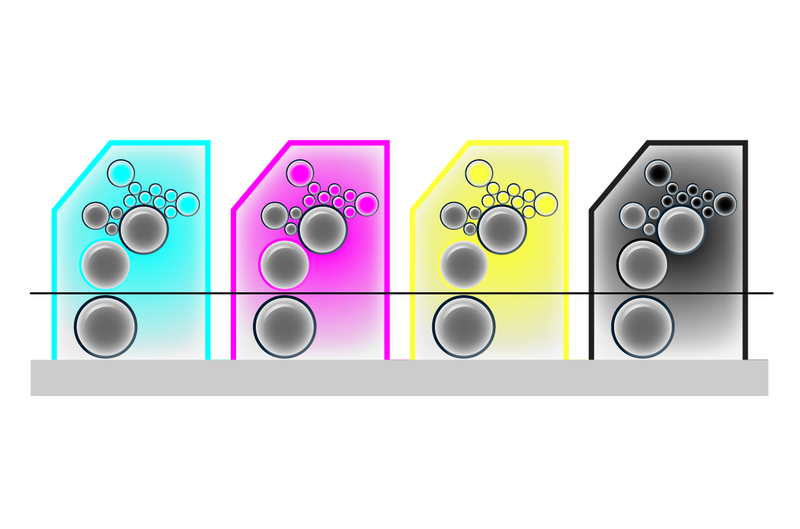 Diagram of CMYK inline printing units. © 2014 Don Arday. Another difference between offset lithography and gravure or letterpress is that offset does not require a printing plate to contain either raised or recessed areas to hold ink. Flat offset plates work on the principle that ink and water don't mix. An image is formed in an emulsion. The emulsion hardens wherever there is image content. Areas without image content are left blank. Ink that is oil based adheres to the image areas on a plate while water or silicone compounds coat the blank areas to form a resist to the ink. Since offset lithography uses 4-process colors (CMYK), and each color is applied to the paper separately, the process requires that original full-color images be translated or “separated” for the production process to be reconstructed using the four colors. Hence the term, color separation. 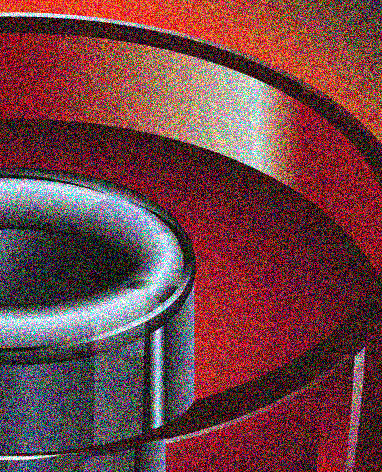 To facilitate translating a “continuous tone” image, i.e., an original illustration, it is broken down into four sheets of film with the image converted to a screen-pattern of tiny dots. The sheet of film corresponds to a process color of ink–cyan, magenta, yellow and black. The dot screen patterns are then applied to individual plates resulting in four separate printing plates. Separated CMYK color plates. © 2014 Don Arday. 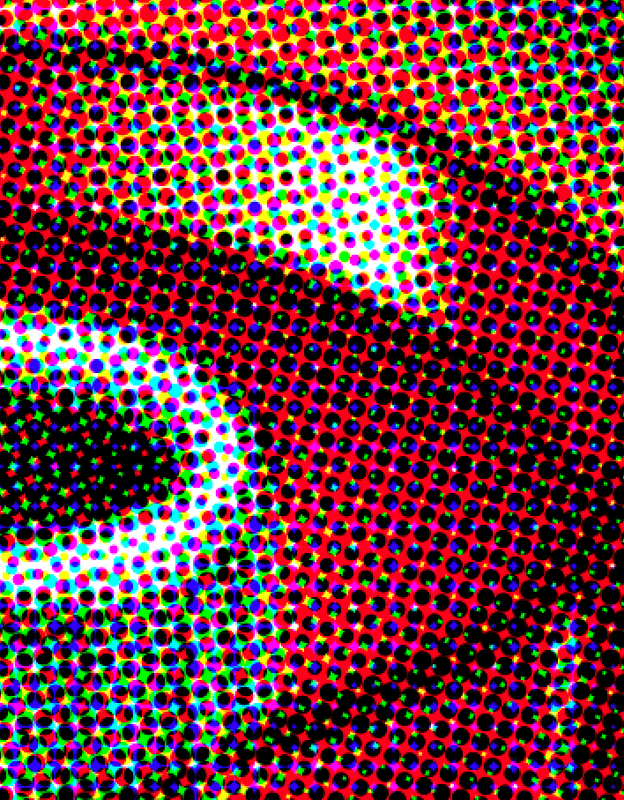 CMYK dot screens in angled allignment. © 2014 Don Arday. The four separate printing plates that were created in the separation process are mounted on a 4-color printing press. The press has separate units, each containing a set of plate and impression cylinders, water and ink rollers, a blanket, and an ink fountain. The printing units are “registered” sequentially, each applying a color to the paper to reconstruct the image by combining the individual pattern of tiny dots. The effect of the small dots being overlaid on one and other creates the illusion of continuous tone color. Wine & Cheese. 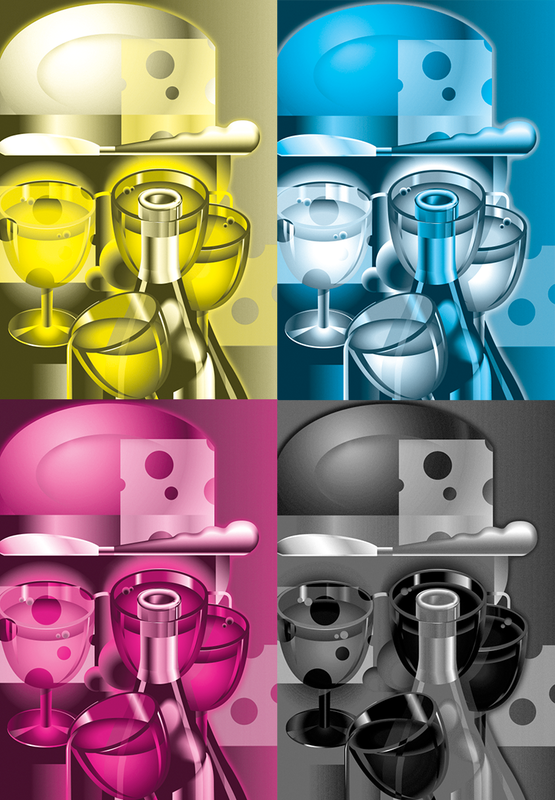 Reconstructed CMYK image using150-line screen. © 2014 Don Arday. screen dot pattern. © 2014 Don Arday. Sheet-fed offset presses print one sheet of paper at a time. Preferable for small to medium quantity printing jobs, sheet fed presses permit extreme fine-tuning of color for optimal image reproduction. For two-sided printing, the paper must be turned over and run through the press a second time. 4-color sheet fed inline offset press for one sided printing. Essentially, a perfecting press is a sheet fed press that can print on both sides of a piece of paper at the same time. Each printing unit contains plate and impression cylinders, water and ink rollers, a blanket, and an ink fountain above and below the paper. Perfecting presses are highly efficient for producing prints like mailers, brochures, booklets and other materials with front and back content. The paper only needs to be put through the press one time. units above and below the paper path. Also called work and turn presses, these offset presses contain a mechanism that can turn the paper over midway through the print run so both sides of the paper can be printed on. A work and roll press differs from a perfecting press in that each printing unit can only print on one side of the paper. 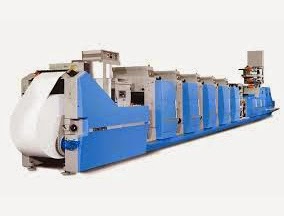 Web offset presses print on rolls of paper that move through the press at a very high speed. 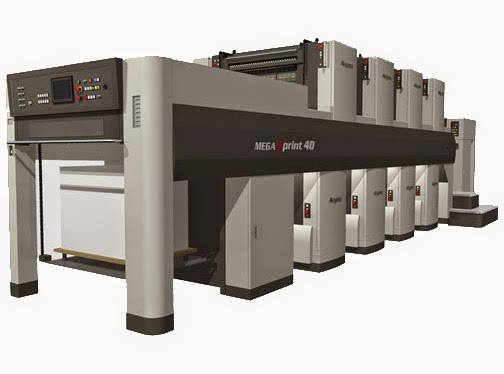 Like perfecting presses, web offset presses print front and back simultaneously. They are best suited to high quantity print runs. Web presses can make up to 12,000 print impressions per hour making them unmatched when it comes to cost per unit efficiency. 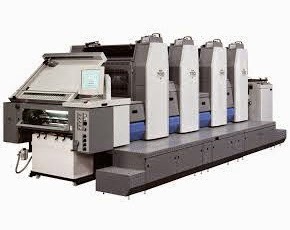 Digital printing differs from offset lithography in that no plates are used to transfer ink to the paper. Images are digitally transferred to the paper using either lasers, positive and negative static charges, or heat using either dry, liquid, or solid toner that is distributed to the paper surface in the form of particles. 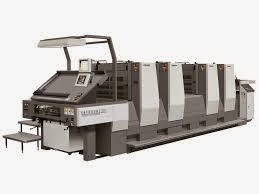 Regarding paper delivery, digital printing presses have the capability to operate like sheet fed, perfecting, or roll fed presses. Depending on the particular press, ink can be deposited on the paper as separate CMYK colors in a sequence, or all colors simultaneously. Digital and offset presses both produce similar results with 4-color process inks. Most printers feel that offset lithography produces higher quality results. Below is a comparison of inkjet and offset printing. inkjet print dot pattern. © 2014 Don Arday. 250-line screen dot pattern. © 2014 Don Arday.